The title signifies the magnitude of the earthquake that shook Japan. ‘M’ is the magnitude and ‘9.0’ is the strength of the earthquake. 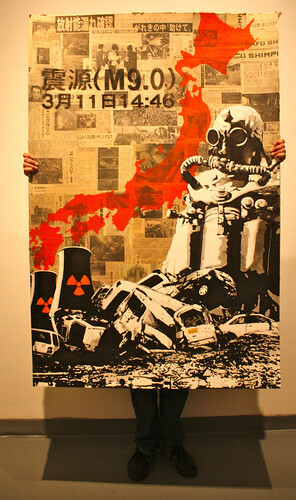 Mixed media - Japanese newspapers, ink, acrylic, and spray paint imported from Japan. On March 11th 2011 at 4:46pm (March 10, 2011 at 09:46:23 PM for PST) near the coast of Honshu, Japan an epic disaster unfolded. The country would never be the same. On the other side of the Pacific Ocean Mr. Martinez saw the double destruction of the tsunami and earthquake unfold on TV. As he watched complete villages disappear and the missing numbers of people increase, he felt compelled to do something. 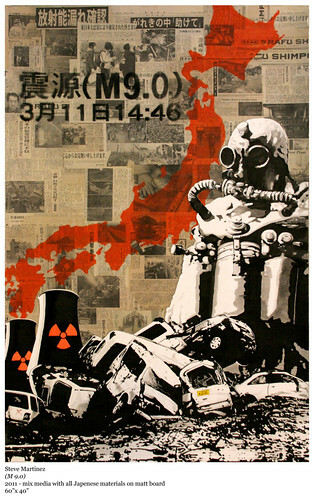 He began compiling newspapers documenting the tragic events, using imported spray paint from Japan, Japanese paintbrushes and ink to produce as his tribute, (M 9.0) in April 2011. Mr. Martinez’s (M 9.0) prints were sold online and through word of mouth. The sales of the prints were donated to the relief efforts for victims of this tragic double disaster. As a youth Mr. Martinez always dreamed of going to Japan and have always been fascinated with the culture. In 2008 he finally had the opportunity to not only visit Japan for the first time but also promote an art show/release party of his book, The Ulysses Guide to the Los Angeles River, a collaborative project with three fellow artists. GK Editions, a Japanese publishing company, published the book early 2008. The experience was not only amazing but mind blowing. It surpassed Mr. Martinez’s expectations; to put it simply he fell in love with Japan. He fell in love with the people, the food, the culture and its history. Mr. Martinez took so much from the 2008 trip that he vowed to give something back to show his solidarity with the people of Japan. Giclee prints on paper (32"x22") are available $180 each.